Your name might seem like a personal issue, and you should be able to call yourself whatever you like — in theory. It doesn’t always work that way, though. You might have a nickname, but when it comes to the legal side of things, only your legal name will work. Your name is also used for legal and financial purposes, and, therefore, it has some official standing. You may be referred to by a nickname in conversation, but when it comes to official documents, like bank checks, you must use your legal name. When signing a contract, like mortgage documents, using a nickname is inappropriate and makes the contract not legally binding. For legal purposes, your identity is attached to a specific name. The most common reason people change their names is marriage or divorce. While it is not required, the social convention is for a woman to take her husband’s name when they marry. The older convention was for a married woman to use her husband’s name as her legal signature, too. A wife might sign as Mrs. John Brown, rather than using her own first name. Today, a wife’s identity is not attached so closely to her husband’s name. It is not unheard of now for a man to change his last name to match his wife’s when they marry. Some couples even choose to blend both of their names, possibly with a hyphen. These are all legal name changes that require some documentation. In most cases, the marriage license can stipulate any name changes that will take place as a result of the marriage. Divorce is another common reason for legal name changes. When a marriage ends, the two parties may want to revert back to their pre-marriage names. Some women choose to keep their married name when they divorce because it matches that of their children. Others want to sever all ties to their former husband by taking their maiden name back. Divorce documents can be drafted to stipulate how the parties will be named moving forward. There are several other reasons you may choose to change your name. People in public positions sometimes shorten their names for convenience or change a complicated name to something more common. Names are sometimes changed to eliminate an obvious tie to particular nationality or ethnic group. A name change cannot be used to evade the law, so you also cannot change your name to escape debt, child support or other financial obligations attached to your current identity. A name change is mostly a point of personal preference and something that might associate you or disassociate you from a group of people, a family or a national heritage. The forms ask simple questions like what name you want to change to, why you are making the change and what, if any, previous aliases have you had. The forms can be found on your state website along with a description of the process. You will need to complete the forms, have them notarized and file them with the court. A notary is an important part of any legal transaction, such as a name change. Superior Notary can handle all of your notary service needs with a mobile notary. Use our contact form to schedule a notary to meet you any time to notarize your name change forms. When this process is complete, the court will issue you a court order that makes your new name legal. You will want several certified copies of the order to notify all of the appropriate entities of the name change. Once your name change is complete, you will want to inform your friends and family. It is also important to notify everyone you do business with of your new name. You are still the same legal entity with the same social security number and financial history, but you have a new name. To avoid confusion, your new name needs to be added to all of your accounts. For some of these name changes, you may need to show a certified copy of the court order. If you start by changing the name on your license and social security card, you can use those for identity verification. A name change is not a difficult legal matter, but like all others, it requires accuracy. When you are ready to file your name change, you will need a notary to complete the forms. 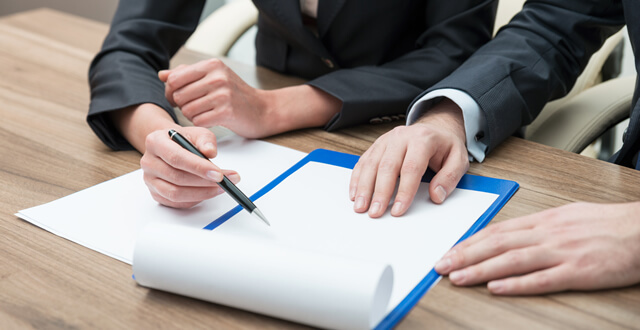 Superior Notary Services has a network of reliable notaries across the country. Instead of searching your town for a notary, you can schedule one of our mobile notaries to come to you. Our professional notaries are accurate and fully insured. Plus, they are available when you need them — not just during the business day. Contact Superior Notary Services to make your name change even easier and hassle-free.